Last week was Mother’s Day and besides the immense gratitude I feel for the blessing of having a loving mom, it got me thinking about the journeys her ancestors took through the years- forming the backbone for her coming into existence. I came to the conclusion that somehow, travel has to affect our genes. 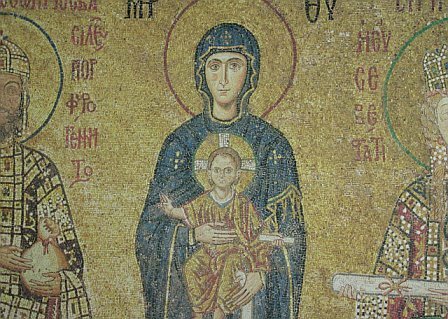 Byzantine fresco depicting Mary and Jesus in Hagia Sophia. Istanbul, Turkey. Throughout history, people have been relocating for a number of reasons and many times not even out of choice. Climate change, war, political, religious persecution, a lack of opportunities, or a combination of things have forced millions out of their homeland. Albert Einstein was a refugee himself. in any case, it’s safe to say that most of us have at least more than one background influencing our family. I learned in a rather strange way that my family was Jewish. It happened at a Bar Mitzvah where suddenly I became extremely drawn to traditional Jewish music and mentioned it to my mom. It turns out my maternal grandmother’s family were Sephardi, forced to leave their adopted homeland following Spain’s 1492 edict of expulsion. After some time in Morocco, they chose to start a new life in America, specifically Medellin, Colombia. They were apparently forced to convert in the process so they took on the Roman Catholic faith. Years later, my grandmother moved to the U.S bringing my mother along, who eventually met my father (a Uruguayan) while working in an art gallery in Chicago. Talk about a twist of fate that allowed my siblings and I to come in to being. Though I suppose that’s actually pretty common. Through the years we moved a lot, Montevideo, Sedona, Chicago, Miami, back to Montevideo and back to Miami. I can safely say that I’ll always carry those places in my heart. But ultimately, I consider myself a ‘citizen of the world’ excuse the cliche. i hope many of you can relate. So here’s to all the mothers in the world. To their motherlands and the lands of our ancestors. And to the fateful journeys that set the stage for all the possibilities in the world. Hi openhearttravel. Yes I remember my wonderful mum who passed in the 80’s. Travels not in me though I would like to see a lot of haunted sites around the globe. Thank you for liking my poem The Cage! Peace and Best Wishes. The Foureyed Poet.